St Anne’s – Shandon hosted its fifth ‘Shandon Sunrise’ at 6.02 am on 1st May . The dawn was greeted from the tower of St Anne’s in song by the O’Boyles (father and son) with Voci Nuove Chamber Choir. This was followed by a celebration of the Eucharist in the church. This event has become a much loved annual event and marks the ancient celebration of the first day of summer. 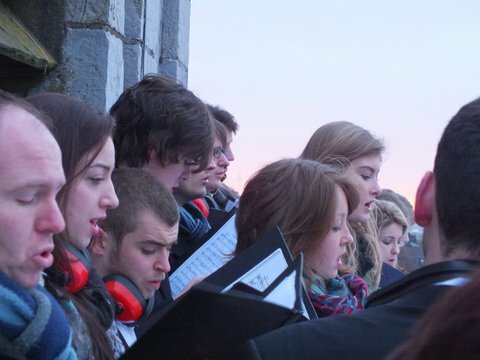 The Choir Crowds outdoors near the top of the tower of Saint Anne’s Shandon to sing in summer! This entry was posted in Church in Society, Church Services, Parish News, People from the Diocese. Bookmark the permalink.